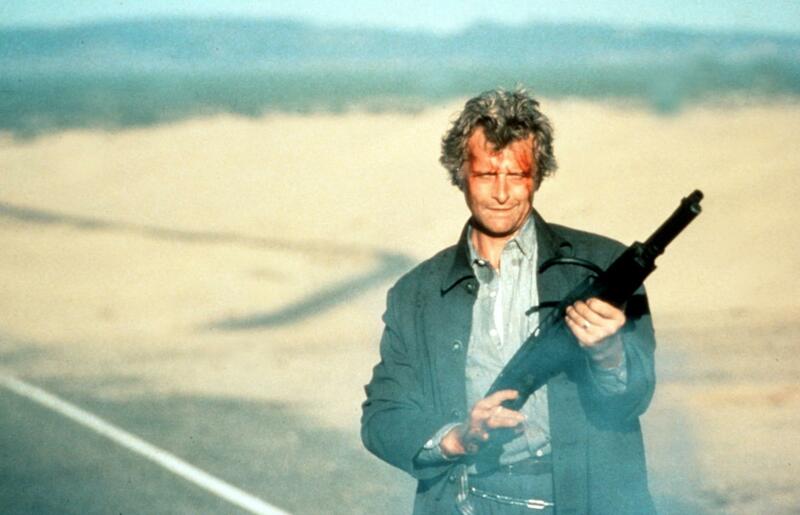 Rutger Hauer would tread some pretty diverse ground during the 1980s. Not only would he immortalise himself with his spellbinding portrayal of white-haired replicant Roy Batty in Ridley Scott’s sci-fi masterpiece Blade Runner, he would later play a baseball cap sporting blind ninja in Phillip Noyce’s deliciously absurd action movie Blind Fury. One of those films is an epic sci-fi masterpiece, the other is an action road movie one might associate with the likes of Arnold Schwarzenegger at his most flippant and self-mocking. Hauer possesses the kind of talent that has been known to turn some into snobs, but he approaches both of these roles with the same energy and zeal, helping to forge two wonderfully entertaining movies that couldn’t be any further apart. Sandwiched between those two performances is his turn as a murderous hitchhiker hellbent on a rampage of nondiscriminatory destruction. 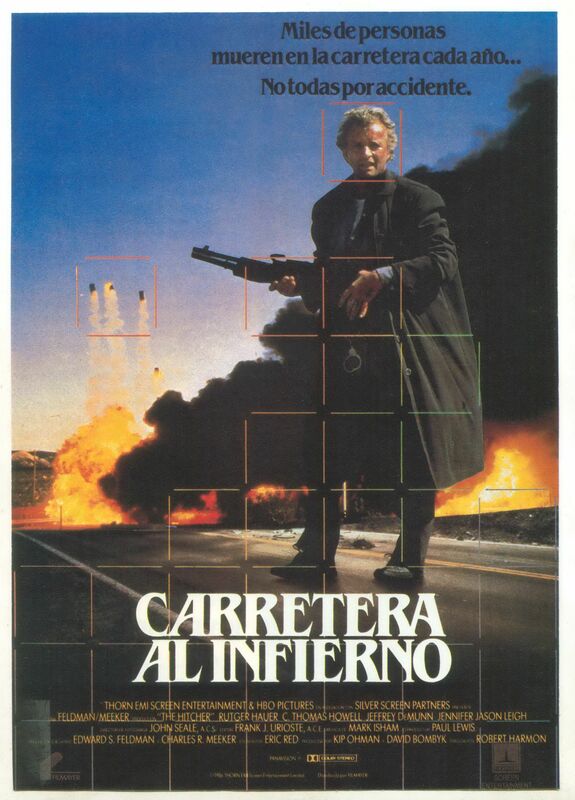 The Hitcher is one of the first movies I ever recall seeing that sent me to bed with food for thought, the kind topped with an unhealthy lashing of severed finger, and for those of you who have seen this film you’ll know exactly what I’m talking about. I couldn’t remember too much about it until a recent re-watch. I had glimpsed at it in passing a few times and felt an echo of that fear, but when I consumed it as a whole it all came flooding back, particularly a scene in which stunned protagonist Jim Halsey (C. Thomas Howell), recently arrested and locked up in the local cop shop, walks free of his open jail cell and lurches tentatively through the empty corridors as the stifling hue of death creeps upon him. Jim is startled, tentative, fearing the worst — an exact reflection of my young self. Another moment that really stuck out was a scene in which Ryder totalled a gas pump in a stolen pick-up truck, casually striking a match and tossing it glibly to the ground, a disbelieving Jim, rolling around on the petrol-soaked asphalt, fleeing the scene in a panic of flames. One of our readers was kind enough to point out that the sequence in question was the work of future Mad Max: Fury Road director of photography John Seale, and it is beautifully captured — not the big budget spectacular of George Miller’s glorious franchise reboot, but eye-catching nonetheless. A parting shot of Jim during the movie’s end credits, all blank silhouette and orange pastel, is equally striking. Jim Halsey: My mother told me to never do this. 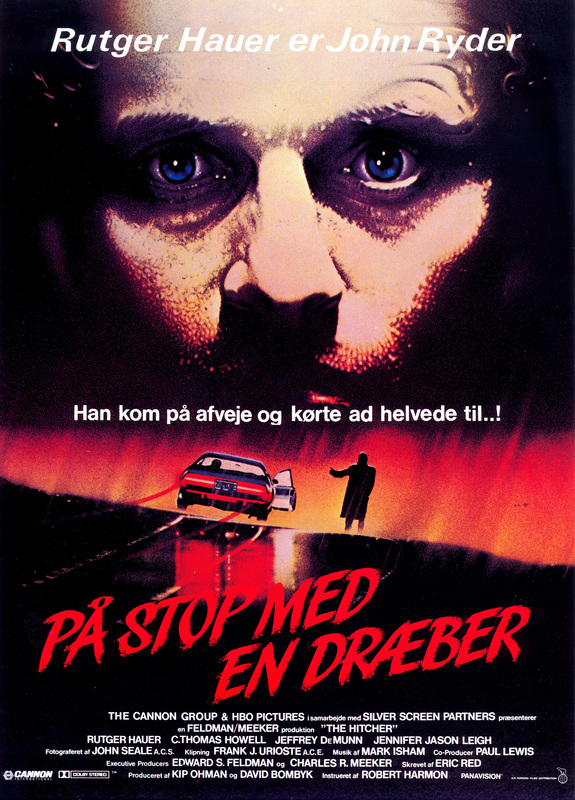 Funny then, that The Hitcher was slammed by critics across the board — particularly the Pulitzer Prize winning Roger Ebert, a legendary mind renown for his often distracting aversion to all things horror. When it comes to criticism, Ebert was a king amongst men, but there were occasions when his emotions got the better of him. He wrote off Die Hard based on a solitary character, deeming Paul Gleason’s Deputy Police Chief Dwayne T. Robinson too dismissive to stomach, while citing the equally dumb cops in the Dirty Harry movies as amusing, a fact gleefully brought to his attention by love-hate colleague Gene Siskel. When censorship hysteria was at its most rampant during the early 1980s, Siskel and Ebert were two of the campaign’s biggest advocates, even going as far as to publicly read out the names of those involved with production, a move that sparked a witch hunt befitting of the genre they were disparaging — with hindsight being 20/20, not the smartest move. Ebert’s review of The Hitcher was just as damning. There was something about unmotivated violence that affected the legendary critic’s sensibilities, the very reason why he was so outspoken on the Friday the 13th series, and he viewed The Hitcher in the same morbid light. As far as he was concerned, the film was unnecessary from start-to-finish. 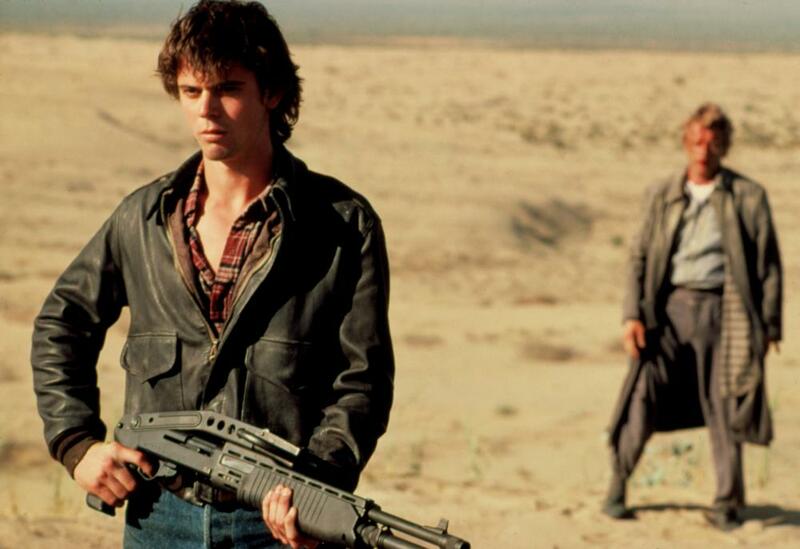 His main qualm was Ryder’s lack of motive and backstory, not to mention the kind of needless cruelty that floods the movie’s West Texas landscape like a dulling wine. Ryder’s particular brand of torture is not just physical, but psychological. Not only does he hitch a ride with our young protagonist, he tracks him for the remainder of his journey, simultaneously framing him for the brutal murders of anyone he happens to come into contact with. Whether Ryder is looking for a pawn from the outset is difficult to gauge, but those like Ryder generally are. It is hard to judge a mind that is so alien to the majority of the human race. The fact that The Hitcher makes entertainment out of such a character may be seen as reprehensible, but as humans we fear that which we do not understand. It is the very basis of horror. You only have to look at the likes of Ted Bundy to know that what we are dealing with is an monster beyond our comprehension. Once captured, serial killers are portrayed as immensely complex individuals, or at the very least portray themselves as such. They are typically narcissists who view themselves as existing on a higher plain, but their victims see a side we don’t — that moment of pure brutish evil that punctuates their final act, and for the most part that’s as far as the movie goes. Is The Hitcher exploitative? Of course it is, but moral outrage is far more irrational. Hauer is one of the very finest when it comes to portraying characters who are seemingly bereft of emotion, and his portrayal of Ryder is no different. He exudes an icy nonchalance, a casual malevolence that borders on humorous before bluntly confirming that no humour resides there. In Halsey’s fresh-faced cherub he has the perfect foil, a sheltered young man who is about to get a rather nasty dose of reality. This is a game of cat and mouse, but not as we know it. Just when you think the chase is up, Ryder pops up to spoil the party, exhibiting an almost supernatural ability to be everywhere at once. Each time he gets his claws in he lets go, but even when Halsey is apprehended by sheriff cowboys looking to make an example of the city boy who heads their suspect list, Ryder is there to simultaneously free him and dig him a bigger hole. This is the kind of game he doesn’t want to end. One of the movie’s strengths, and presumably one of the main reasons why critics were so appalled, is its ability to defy convention. On his unfortunate journey Halsey becomes Death incarnate. Every life he touches is doomed as a consequence, but when he meets a trusting, out-in -the-sticks waitress named Nash (Jennifer Jason Leigh), you smell the pretty scent of redemption on the horizon. But there is no happy ending to be had here. This is mano-a-mano, a frenzied gauntlet to the death that swats all other participants aside, a formula that leads to one of the most agonising and unexpected movie deaths you are ever likely to behold. Jim Halsey: [whispering] John Ryder. Captain Esteridge: What’d you say? Jim Halsey: His name is John Ryder. Through their relentless back-and-forth, the two opponents form a strange bond, one of almost co-dependency. In some ways their connection reminded me of that between Batman and nemesis Joker in Christopher Nolan’s The Dark Knight. On some warped level, they thrive on each other, and everything else is peripheral as a consequence. With his destructive powers, Ryder would likely give Arnie’s original T-800 a run for his money, and in his efforts he moulds his very own John Connor, a gangling sweetheart who will ultimately be carved from granite. Critics are often quick to dismiss horror as an inferior genre, and that’s exactly what Robert Harmon’s thriller becomes as the humorous streak gives way to grim inevitability. 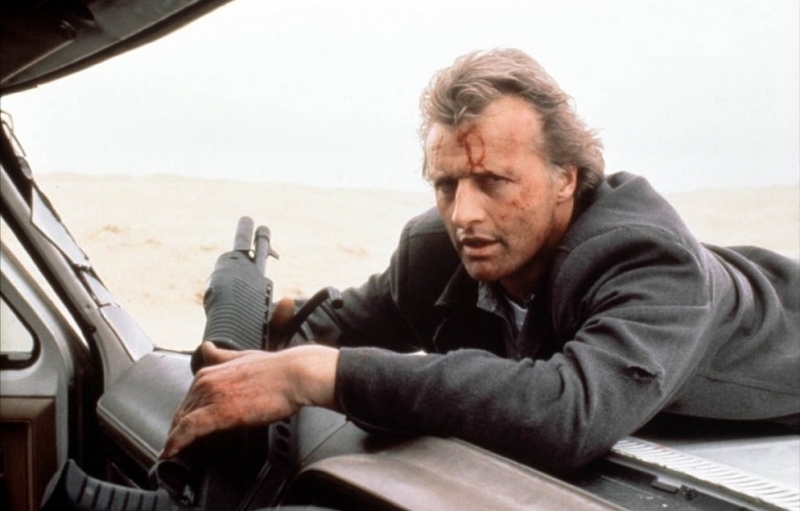 Everyone is entitled to their opinion, and there are no absolutes, but for me The Hitcher is not the sick piece of trash many had it pegged for. Instead, it is a tightly-plotted, fear-inducing thrill ride full of memorable performances, a movie that defied the kind of narrative conventions that allow us to sleep easy at night. Hauer’s performance, in particular, is typically inspired as a relentless sadist with an almost otherworldly omnipotence. 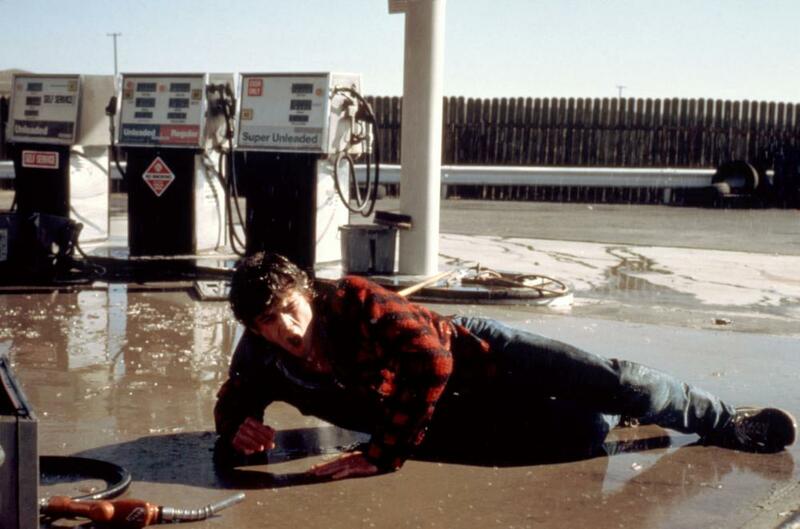 A lack of insight and resolution may be damning in the eyes of those who simply have no time for The Hitcher, but as with Steven Spielberg’s nerve-jangling debut thriller Duel, sometimes the less we know about a pursuing menace the better. 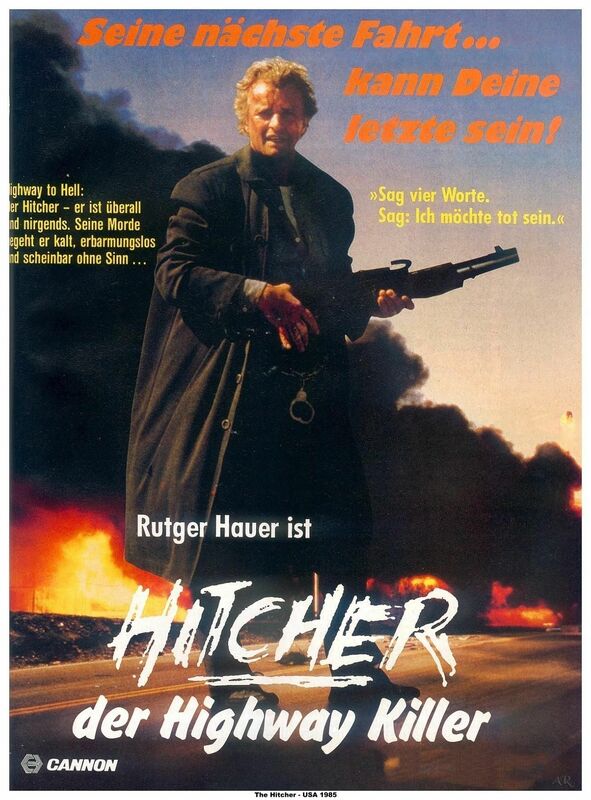 ‘The Hitcher’ is my favorite of its type. What drew me to it was the fact that the plotline involved a main character who was a male, rather than the typical and clicked female, who in such storylines become the prey. Have you ever noticed how in the vast majority of disaster/horror films the survivor/s is/are usually a female, or a hetero couple? Or, how usually a man/hero comes to the rescue of a woman/girlfriend as if no other type of relationship exists. 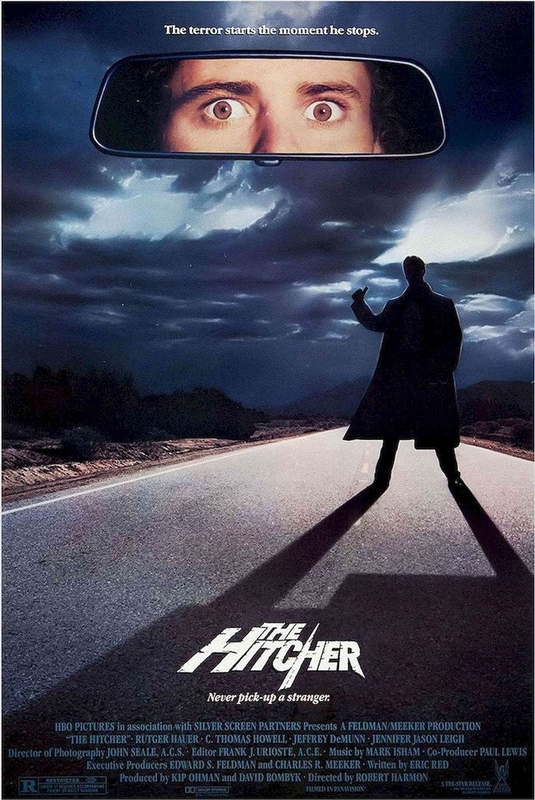 This is why, for me, ‘The Hitcher’ was thumbs-up, and something different. Absolutely! That’s a great point. This one steered away from conventional resolutions, which is presumably why some critics found it repulsive. I thought it made for interesting viewing. Someone should make a horror with a gay badass who flips the script and wipes the floor with everyone. That’s I’d pay to see.